40 Years Later–First Novel Now Available! Finally! One of my novels is complete. 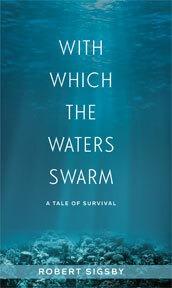 With Which the Waters Swarm has just been put up on Amazon.com and will be available other places as well. It’s available in both print and as an e-book. I’d love to get some feedback on what you think of it. It’s the story of a herd of North Pacific Fur Seals who are threatened by sealers facing a recession. The men therefore ignore all international rules regarding how many seals they can take. In other words, the seals are being wiped out. During their Great Migration, the seals, absent their protective leaders who were taken by the sealers, must come up with ways they can fight back. Each seal has an adventure during its Journey that contributes to the knowledge base of the herd. A grand battle ensues upon their return. I’ll leave you to read it to learn the outcome. I started this novel while riding the bus into Boston many years ago. I’d start writing when I got on the bus for the hour’s ride into the city and not stop until I got off. Then I would hurry out of work at the end of the day, hop aboard, and continue. I’ve been “massaging” it ever since. Hopefully, it will be worth the wait. I think the book will be of interest to everyone from middle school through adult. But you tell me. This entry was posted in Uncategorized on November 3, 2017 by siggersbee.